I'm not the biggest fan of sprouts (apparently of any variety, as I've come to learn), but I do love cabbage, and the sound of a salad dressing with wasabi powder and mirin just sounded too good to pass up. 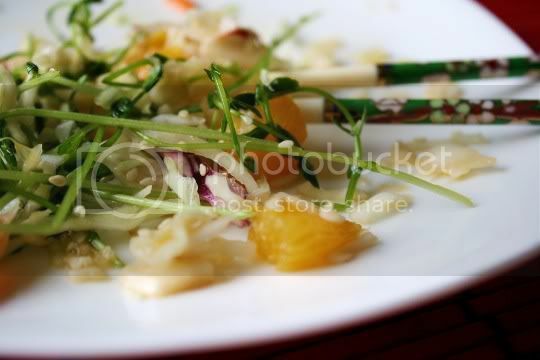 This is certainly an interesting take on a salad, and although it's supposed to be Japanese-inspired, I somehow can't imagine eating this at a typical sushi restaurant. The recipe is fairly easy to make, with most of the time being spent with veggie and fruit prep. And don't believe anyone when they tell you supreming an orange is difficult, because it's not. In fact, that's probably what takes the longest, and that's maybe a total of 5 minutes. Just cut off the peel, and cut out the segments...that's it! 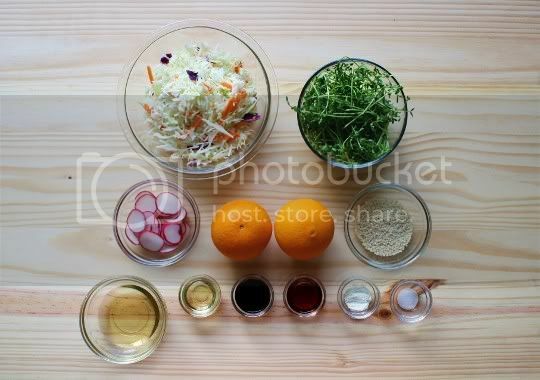 Anyway, combine in a large (emphasis on LARGE) bowl: the supremed orange segments, shredded cabbage (I used the pre-shredded coleslaw mix for sake of ease), thinly sliced radishes, and snow pea sprouts (found at Whole Foods). Next, make the dressing: whisk rice wine vinegar, mirin, soy sauce, sesame oil, wasabi powder (found at most regular supermarkets in the Asian section), and salt. Pour this over your salad mix, toss well (this is why you'll need a large bowl, those sprouts can really fly), and let stand for about 10 minutes, tossing occasionally. The point is to let the sprouts wilt, which will eventually happen. For serving, sprinkle with a nice helping of toasted sesame seeds. My first mouthful of this salad confirmed my suspicions: I hate sprouts. Alfalfa, sunflower, snow pea, whatever. These are stringy and chewy, and very hard to eat. They taste like a milder, less sweet, slightly bitter version of snow peas (which I DO like), yet they have that sprout-y plant-y dirt taste which I think really overwhelms the other flavors of the salad. On the other hand, the cabbage is delicious with the dressing. Tangy, sweet, and smoky, although I didn't quite get the bite I was expecting from the wasabi. 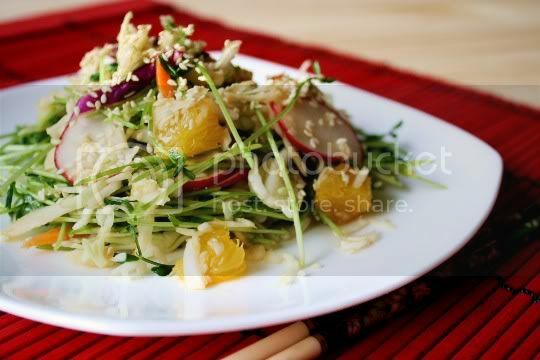 The radishes provide additional crunch, and the oranges add a delightful juiciness and surprising citrus flavor you wouldn't expect from a Japanese dish. Make again? Possibly...without you know what. Do you think that you can enable your "Follow" feature so that I can keep up with your Blog Posts as a friend? Love your blog! I've been trying to add you to my google reader but it doesn't work. Maybe you're feed isnt enabled or something? Thanks! Ummm, I'm not sure I even know how to check that. Help! Or if you're on Facebook or Twitter, friend/follow me to get post updates, etc. Wow, what an interesting dressing. Make your own sprouts and rinse them often - taste a LOT better, not like dirt.